Essential teaching for every short- and long-term outreach participant & every church and mission agency that sends them. 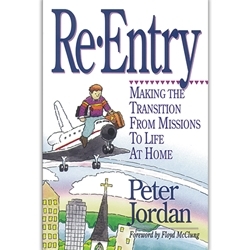 Peter Jordan's vital, insightful teaching on the challenges and opportunities that await returning missionaries makes this essential reading for everyone involved in missions. A missions "must-read"! "I'm really excited about this book and thank God for its important and vital message. It is thirty years overdue! Short-term missions without this emphasis and teaching can easily end up as a tragedy instead of a triumph." "Having counseled with hundreds of returning missionaries, Peter & Donna know from experience the re-entry challenges and opportunities that await missionaries worldwide. They have much to say on this vital subject of re-entry... and the authority to say it."